An increasing number of foreigners are getting attracted to the International Sahaj Yoga centre at CBC Belapur. At present, members from twenty-eight countries have joined this centre. What’s impressive is that within three years of starting its operations. The Centre has, besides Indians, more than 170 people from United States, UK, Switzerland, Belgium, Austria, New Zealand and Australia. They were admitted in the research and health section. Founded and started by Shree Mataji Nirmala Devi three years ago, today this centre has more international visitors than Indians. 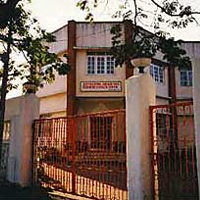 Situated in sylvan green environs, the International Centre for Sahaj Yoga Research and Health Centre is an unique centre of its kind in the world, where treatment is done by vibratory awareness, developed by Sahaj yoga meditation. In February 1996, Shree Mataji Nirmala Devi, a renowned spiritual scientist of the world, founded and threw open this sprawling centre. Dr. U C Rai, former head physiology department Jawaharlal Institute of Post graduate Medical Education and Research, Pondicherry, and professor in various medical colleges of Delhi, heads the Centre at Belapur, as its director. Recently, he was conferred with the Vladimir Verniczky Honoured doctor award in Moscow, for his research on Sahaj yoga at the centre. Narrating about a rare recovery of a patient, S S Agarwal from Delhi he said, “His was a case of chronic renal failure, for which doctors had ruled out all treatment, except ongoing dialysis. By applying Sahaj yoga, we aroused his Kundalini energy (which is a dormant energy at the base of the spine) and directed it towards the kidney to clear his blocked chakras.” Today, Agarwal’s medical reports indicate near normalcy. Katherine Reid from England (who suffered from irritable bowels syndrome) is a happy woman today, in contrast to her life previously when she had to take several medicines prior to her arrival in Navi Mumbai. “I feel much better having stopped my medication completely. My health has improved by about eighty per cent.” Anna Kargaity, a Canadian who suffered from depressive psychosis is full of smiles today. “I now have a positive outlook towards life, being able to develop my own personality and express my feelings”, she says. Similar benefits were highlighted by Belinda from Australia, Kumar from Canada, Bryan from USA and others. We do charge them for their stay and for the food provided by us, he adds, but not for the treatment. “Anyone can heal themselves using Sahaja Yoga as this energy is present within every individual. Why should we charge anyone?” comments doctor Rai. With over fifty foreigners having already taken treatment from the centre, between January 1 – February 14, 1999, a record number of international visitors are likely to arrive during the coming year.